A team of GIA certified gemologists that have experience spanning three generations hosts our Diamond Division. The team has insight into the diamond market worldwide with a direct presence globally in all major events related to diamonds, gems and jewelry. This insight provides the Diamond Division with a strong advantage in evaluating diamonds at the most updated prices, providing more value to our customers. Quality control is enforced throughout every step of the evaluation process, beginning with opening packages under a fully secure environment. Every parcel is sorted carefully according to its size and shape, then inspected by two gemologists to ensure the accuracy of each evaluation and maximize on the offer. 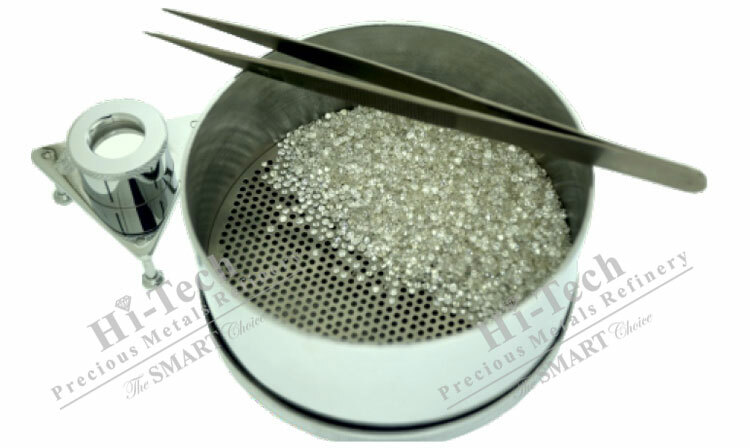 We also have the advantage of an in-house Stone Removal Laboratory that assists the Diamond Division in separating stones in a timely manner as requested by the customers, for better evaluation. Our Diamond Division is truly unique for housing its own diamond cutting operation that provides an edge in maximizing profits for our clients. Our expert in-house diamond cutter is available to assess, cut, and polish broken, chipped, and rough diamonds using the most advanced technologies in the diamond manufacturing industry. Our Expert Customer Service team is always available to assist you one-on-one through every step to bring you the best experience. The team handles all of your insured overnight priority shipping, same day offers, and same day payouts with speed and friendly service. Start your SMART account today and enjoy online trading using your computers or smart phones. For more details visit the SMART Portal.